Eighty-eight years ago this week, Harry Houdini, the famous escapologist and magician, survived for one-and-a-half hours in a bronze coffin in a hotel swimming pool in Los Angeles. With the passage of time and the trickery undoubtedly involved, it’s hard to say whether the stunt was particularly tough or not for the most famous escapologist in the world. What is known is that by that time Houdini – born Erik Weisz in Budapest – had been performing his escapes for nearly 30 years. But at the time of the coffin stunt, he didn’t have long to live, as peritonitis claimed his life in a Detroit hospital a little later that year, on October 31. He was 52. Perhaps he thought himself invincible. Hours earlier, running a high fever and diagnosed with acute appendicitis, he eschewed advice to have immediate surgery and performed a show in the city’s Garrick Theatre instead. But the illusionist and escapologist always insisted that it was a Birmingham locksmith who gave him “one of the hardest tests” he ever had. The locksmith was Nathaniel Hart. He had taken five years to perfect a pair of handcuffs with a supposedly unpickable lock. In March 1904, The Daily Mirror threw down the gauntlet to Houdini, then at the height of his fame, to free himself from the contraption. Houdini was performing at a packed Hippodrome Theatre in London’s West End and issued his customary invitation for ­challenges to ­spectators. Dozens had come forward, each handing him shackles that the self-styled “Handcuff King” slipped out of with astonishing ease. But then came the Mirror ­reporter’s turn. He presented the star with the pair of steel cuffs made by Nathaniel Hart. Hart believed “no mortal man” could pick his lock. And several of London’s leading locksmiths had inspected the solid steel shackles and agreed they had never seen such a wonderful or fiendish mechanism. It’s unclear whether Hart was in the audience or not. But Houdini took one look at the lock and refused three times to take up the challenge. He was eventually persuaded to return for a matinée show five days later, where he would pit his wits against the best of British craftsmanship which had produced the sturdy shackles. The great man was given the handcuffs again. At first Houdini tried to duck the challenge, claiming he only attempted to escape from regulation police cuffs. But he relented and on March 17 – a week before his 30th birthday – he took to the stage at the sold-out Hippodrome to a standing ovation from 4,000 fans. Houdini disappeared into his stage cabinet, which he called his “ghost house”, to embark on his escape as the band began to play. After 22 minutes the star’s face poked out – but only to get a better look at the lock in the strong electric light. As the clock reached 35 minutes Houdini emerged again, his collar broken and sweat pouring down his face, complaining that his knees hurt. The cuffs remained in place, but he insisted he was not done. Admiring his resolve, the reporter offered the magician a cushion to kneel on. After another 35 minutes he emerged again, to groans – the shackles were still on. 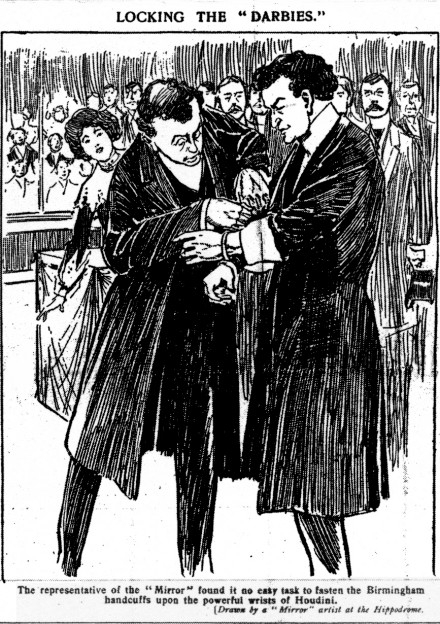 Houdini asked the Mirror man to remove the cuffs so he could take off his coat. The reporter refused, so the escapologist took a penknife from his pocket, flipped the garment over his head and cut it to ribbons. Determined, Houdini went back into the ghost house for a final time. And 10 minutes later, with the band reaching a stirring crescendo, he emerged triumphant – with the cuffs held aloft. After an hour and 10 minutes, he had escaped. The crowd erupted, waving their hats and handkerchiefs, before one man dashed forward, lifted Houdini on to his shoulders and carried him around the arena. It was all too much for the star, who began sobbing. The newspaper later presented him with silver replica of the cuffs and he responded by sending it a grateful telegram. Nothing more seems to have been reported on Nathaniel Hart, the Birmingham locksmith who almost beat him. But many years later, after Houdini’s death, his friend Martin Beck was quoted in Will Goldston’s book, Sensational Tales of Mystery Men, as admitting that Houdini was beaten that day and had appealed to his wife, Bess, for help. Goldston claimed that Bess begged the key from a Mirror representative, then slipped it to Houdini in a glass of water. Another suggestion is that when she appeared on stage to give her husband a kiss, in her mouth was the key to unlock the special handcuffs. But another book, The Secret Life of Houdini, said that the key required to open the specially designed handcuffs was six inches long. That would make it almost impossible to be passed in a kiss, or smuggled to Houdini in a glass of water. So whether Houdini managed to pick the near unpickable lock, or used the key, remains a mystery.